Wahl have developed an animal ear cleaner that is gentle but effective. The solution can be applied to the ear then wiped away, taking the dirt and wax with it. 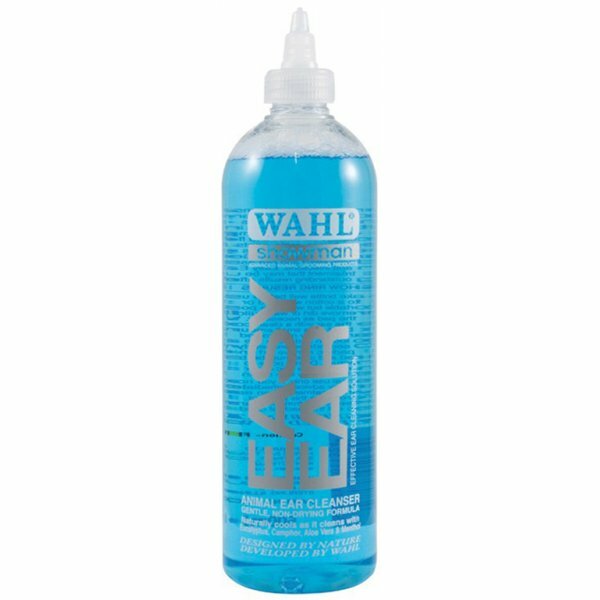 Wahl Easy Ear Cleaner is a free flowing cleansing fluid, based on natural ingredients, which contains no harmful detergents or cleansers. The perfectly balanced formula effectively removes dust, dirt and ear wax with little or no rubbing. Active ingredients include Aloe Vera Gel and Menthol to soothe the ear and cool irritation, plus Camphor to assist in reducing inflammation and Eucalyptus to discourage ear mites and fleas. Suitable for use on most animal ears, including dogs, cats, horses, cattle, goats, llama, alpaca, rabbits and ferrets, Easy Ear Cleaner effectively eliminates grease and wax and, used regularly, can reduce and control ear odour. Gentle cleansing and soothing agents act without any drying effect and can assist in reducing tenderness and non-specific irritation and infections. Easy Ear is a natural, non-foam, cleaning and therapeutic treatment that may be used as often as necessary.